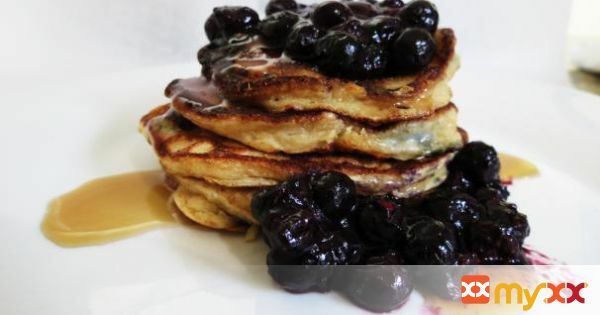 I love these pancakes, there light, fluffy and bursting with blueberries and has a slight banana taste! Perfect low calorie breakfast to start your day off right! 5. Place 1/4-cup batter onto non-stick skillet and cook till bubbles start appearing through the top of the pancake and then flip. NOTE: Cook on medium heat and I flattened out my batter with the spatula to cook more evenly. 8. In a sauce pan, add remaining banana and blueberries and stir until thick, mashing blueberries, about 5-7 minutes. 9. Pour over top of pancakes. 10. Note: I used frozen blueberries for sauce and fresh for pancakes.